And mine is up at http://jveclectic.blogspot.com/2017/03/the-robinsons-encounter-some-strange.html. I look forward to reading everyone's post! 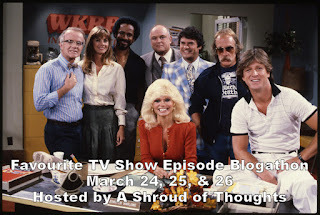 Here's mine: https://kylerobertshultz.com/2017/03/24/favorite-tv-show-episode-blogathon-ryker-the-virginian-s3e1/ (I've dropped the "Dragonthief" name from my blog; I just use my own name now.) Thanks! Here's my review/analysis of the Wanted: Dead or Alive episode 'Secret Ballot' - https://classicsandcraziness.wordpress.com/2017/03/24/wanted-dead-or-alive-episodes-analysis-secret-ballot/. I updated the URL/link I gave you. Here's the updated version - https://classicsandcraziness.wordpress.com/2017/03/24/wanted-dead-or-alive-episode-review-analysis-secret-ballot/. Thanks! Love this blogathon and thank you for making it an annual event! I Love Lucy- "The Million Dollar Idea"
Got my post up for the 3rd Annual Favourite TV Episode blogathon! Thank you for posting my link to my article. My blog is actually called "WhimsicallyClassic" not "Great Moments in Movies." I am so sorry about that, Kayla! I've been coping with an earache for the past two days, so it's hard to concentrate on anything!